Over the years, Valentine’s Day has revealed itself to me to be a complex amalgamation of consumerism and ardent expectation, tradition, and entitlement to the fruits of a tradition which, historically, is the emotional equivalent of a cash cow. Happiness, romance, surprise? Priceless products of a consumer holiday, properly celebrated. …says Capricorn, transiting my first house, fresh out of retrograde. Some may disagree with the above statements. Some may say, the essence of a modern Valentine’s Day is like a mirror which is held up to the sun, and which reflects warmly upon all who wish to (gratefully) bask in the love shone upon them. Show me the sun. Show me the love. Show me the… well, you know. There will be a Full Moon in Leo during the upcoming Valentine’s Day. Leo needs this kind of love. Love to the Sun, and back again. Too bad for Leo, or the Leo in all of us. I pulled a tarot card for the upcoming Valentine’s Day. 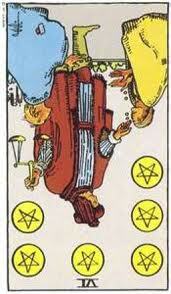 What I got was the reversed Six of Pentacles. Something about this Valentine’s Day will not quite allow the delivery of you whatever you think you need from this holiday. Chalk it up to the Cardinal Grand Cross, or widespread economic hardship, or Venus having been retrograde for a while and just coming out on the other side in time to smell the roses. Any way you turn it, someone either can’t “give” what needs to be given, though they’d like to very much, or maybe they are “giving” to make themselves feel better, bigger, more generous. Another possibility is that maybe you, as a recipient, are receiving something that you haven’t quite “earned,” or don’t wish to reciprocate on that level. It isn’t looking “up” for those of us who celebrate this holiday traditionally. If the giving is over-done, ask yourself some questions. Why is this so above-board? Is this warranted? Do I “deserve” or does this person “deserve” what is being given? My 2014 Valentine’s Day suggestion, if you would like it, is to keep your feelings about giving and receiving as open, and honest, and humble as possible. The ‘humble’ part will probably not be easy, under a Leo Full Moon. You may want to give or receive it ALL, but this year it just isn’t realistic. Above all, be true to yourself and your loved one, if there is a loved one in the picture. If you are single, consider that being your own Valentine and giving to yourself something you do really deserve, something you can give yourself to show some self-love, is in order. If you are partnered, be true to what you know in your great big heart to be true – about the love you’ve given, and the love you’ve received, and how you can realistically reflect that outward. The house where the Leo Full Moon falls in your chart can give you some clue about the color of the Valentine’s Day cards, or where those tricky sentiments might stir up some feeling that the giving/receiving is imbalanced. If you have a V-Day query or situation, go ahead and message me. I’ll pull one card on the house. New Moon in Aries/Noctua Tarot’s First Blog!